LaSells Stewart Center and the CH2M Hill Alumni Center are located at the corner of 26th Street and Western Boulevard on the Oregon State University campus. Drive Highway 99W into Corvallis, which turns into 3rd Street (North) and 4th Street (South). Turn West on Western Blvd. and drive to 26th St. The CH2M Hill Alumni Center is on the Northeast corner of 26th St. and Western Blvd. Turn West on Highway 34 and drive 10 miles toward Corvallis. 1) Turn on Highway 34 toward Reser Stadium/Oregon Coast on the bypass around Corvallis. Turn Right (North) onto 26th Street, go one block north to Western Blvd. and 26th St. -OR- 2) Drive into Corvallis across the Bridge and turn left (South) onto 4th Street. Take 4th Street south until Western Blvd. Turn right (West) onto Western Blvd. 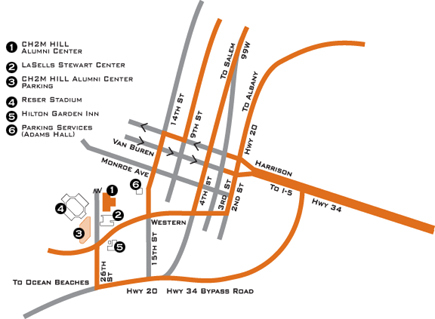 The CH2M Hill Alumni Center is on the Northeast corner of 26th St. and Western Blvd. The parking garage at the intersection of Washington Way and 26th Street can be accessed from 26th just north of the Alumni Center. Parking is $10 Monday - Friday. No charge on Saturday or Sunday. Pay at kiosks on each floor or purchase your pass ahead of time through the OSU Web site, where you will want to purchase a one day pass for Zones B&C. Parking is also available in the Reser Stadium lot. Parking is $10 Monday - Friday. No charge on Saturday or Sunday. Pay at kiosks in the lot or purchase your pass ahead of time through the OSU Web site, where you will want to purchase a one day pass for Zones B&C. We recommend that you make your lodging reservations as soon as possible, as there are many concurrent events at OSU during early March. Not an inclusive list of all area lodging. Rates do not reflect 10.8% lodging tax. Amenities: Across the street from the conference. Restaurant, pool, fitness center, business center. Note: Reservation deadline is February 12, 2019. Make your reservations early, as the room block will fill up. After this date, rooms are first-come, first-served. Amenities: Pet friendly hotel (dogs only). Limited availability for pet-friendly rooms, so please call the hotel directly. Buffet style hot breakfast each morning. Free high-speed wireless internet, refrigerator, coffee maker in all rooms and suites. Close to aquatic center and shopping center. Note: Reservation deadline is February 4, 2019. After this date, rooms are first-come, first-served. Amenities: Continental breakfast. Restaurant next door. Exercise room. Wireless internet. Amenities: Refrigerator and microwave in room. Close to downtown. Indoor pool and spa, laundry, free high-speed wireless internet, free satellite TV and HBO, coffee and continental breakfast. Dog-friendly – $10 per night. Amenities: Complimentary hot breakfast buffet, wireless internet, microwave, refrigerator, coffee/tea maker. Indoor heated pool, spa and fitness center, onsite laundry/valet. Note: Reservation deadline is February 21, 2019. After this date, rooms are first-come, first-served.